UNITED NATIONS, December 9 -- China's proposal that if Navi Pillay briefs on Syria, she should briefing on Palestine as well hit home in the Security Council Friday afternoon. An hour after Inner City Press first reported the proposal, Russian Ambssador Vitaly Churkin emerged to read a short Council statement. He explained that Pillay's briefing Monday at 3 pm on "the Middle East" is understood to include Palestine as well as Syria. Inner City Press asked Churkin if the briefing would be closed, and if Pillay would be questioned about Palestine. Churkin said he expected Pillay would hear what he was saying and that, yes, the briefing would be closed. He said with a smile that at one point Russia proposed the briefing be open, but that those who had initially wanted it open then decided that it should be closed. After Churkin was about Russia's resistance to a briefing of Syria -- he replied that such opposition had been alleged before Russia said anything -- Inner City Press asked if the breakdown in the Council opposing Pillay briefing on Palestine was the same as those not supporting Palestinian membership in the UN. 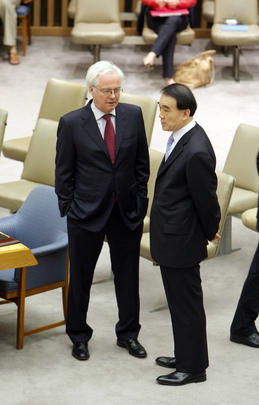 Churkin said there is "overlap," but didn't want to get into the vote or position breakdown. Watch this site.